DIRTY MARY CRAZY LARRY: Rolling Over The Hero/Villain Line At Top Speed – Schlockmania! One of the fascinating things about American films of the 1970’s is their ambivalent relationship with the concept of “hero vs. villain.” Hits like The Godfather and Superfly asked audiences to identify with characters who would be villains in the real world – and they did so with pleasure. This toying with the idea of who could be a protagonist in a film permeated all levels of filmmaking, right down to the low-budget flicks. A fascinating example of this trend at a drive-in level is Dirty Mary Crazy Larry, a car-chase movie whose sense of moral relativity is as head-spinning as its automotive thrills. The film starts by placing a trio of classic 1970’s antiheroes front and center. Hot-headed race car driver Larry (Peter Fonda) and his recovered-alkie mechanic Deke (Adam Roarke) want money to buy a quality racing car so they set out to rob a grocery store’s payroll. An unexpected complication kicks in when Mary (Susan George), the town’s resident “easy girl,” pops up in the getaway car (Larry ditched out on her after their night together). To make things worse, their clean-getaway plan fails and the cops, led by iconoclastic Everett Franklin (Vic Morrow), set out to stop them. Thus, the stage is set for a countryside chase with surprises around every turn. If you want to look at Dirty Mary Crazy Larry as an action flick, it totally delivers on that level. Leigh Chapman and Antonio Santean’s script is sharply paced and laced with cynical humor. 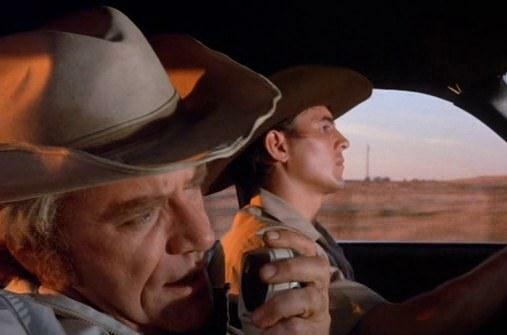 Better yet, it boasts some distinctive dialogue, particularly in its use of rapid-fire gearhead jargon between Larry and Deke. The film also benefits from brisk direction by the underrated John Hough, who gives the film the muscular, visually kinetic style it needs (note his skillful use of push-ins to accentuate conflicts between characters). Excellent stunt driving seals the deal: the best moment in this area may be a chase between the heroes and an overzealous tough-guy deputy named Hank (Eugene Daniels). However, there’s another level at play in Dirty Mary Crazy Larry that makes it as compelling as the story or the stunts. It’s the film’s defiance of the basic good guy/bad guy storytelling setup. Even though Larry, Deke and Mary are our main characters, the film never tries to give them a motive for their deeds: they haven’t been wronged by a corrupt establishment figure and they aren’t fighting for a cause. Larry’s main motivations are greed and impatience. More importantly, the lawmen aren’t portrayed as abusing the law or being a force of repression. Instead, they’re just trying to do their job – and Everett Franklin is every bit as iconoclastic and contemptuous towards authority as the kids he’s chasing. There is also a fascinatingly dysfunctional arrangement going on in the film’s anti-heroic triumvirate. Larry is our main protagonist but he’s also terribly self-destructive, always allowing his ego to outrun his common sense and needing control so badly that he’s constantly needling/testing his accomplices to their breaking points. Mary is not an empowered figure of female independence: instead, her tendency of “getting around” is portrayed as an outgrowth of her emotional neediness. Deke could’ve been a hero but he has a fatalistic streak that dooms him to terminal “second banana”-hood. Their relationships constantly shift and reform, ensuring that the audience is never allowed to get comfortable with them. That’s a tricky set of demands for the cast to navigate but they pull it off. Fonda’s low-key approach to acting fits the inscrutable moodiness of Larry perfectly, allowing him to shift back and forth between charming and nasty with disarming ease. Roarke, an underrated character thesp who worked several times with Richard Rush, is appropriately deadpan but also shows great comic timing and fierce anger when the situation calls for it. George was always great at bringing intensity to her performances and she gets to do that here: it’s easily the most emotionally demanding role in the film and she pulls it off beautifully. However, she also gets to show a seductive, playful side that is just as effective in the moments where she matches wits with Fonda. On the straight-society side of things, Morrow makes the most of every scene as the reluctant lawman. Though he gets less screen time, he’s every bit as charismatic as the heroes and manages to make world-weariness seem like an expression of outsider cool. Amongst the supporting cast, Daniel deserves notice for his funny turn as the most cartoonish of the deputies and Roddy McDowell pops up for an effective (and uncredited) cameo as the grocery store’s owner. 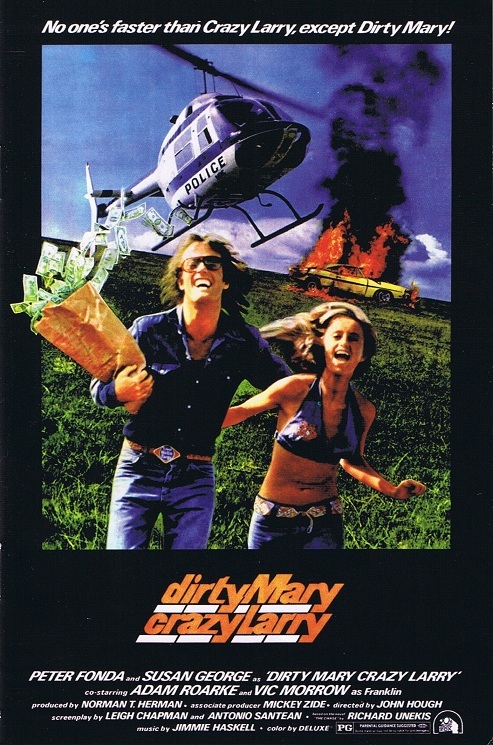 To sum up, Dirty Mary Crazy Larry is more than a classic car-chase flick. It’s also a memorable expression of the shifting morality going on in American filmmaking during that disillusioned Watergate era. Whatever way you choose to take it, this unexpectedly complex genre pic is a cult movie trip worth taking. Previous ArticleSchlock-Wire: Schlockmania Appears On The SCREAM-A-RAMA Podcast At TheAvod! Ahhh, my kind of drive-in show!